Major Sills died less than a month after the armistice was signed, while he was still active in the Officer Training Corps at Bradfield College. Though it appears that he never took part in front line fighting, the contribution of the OTC to ensuring the quality and leadership of commissioned officers in the British Army was an important factor in its ultimate success. Thomas Barnard Sills is one of the men named on the Bottesford ‘church list’ of WW1 servicemen, where he appears as Barnard Sills, his first Christian name having been omitted. He was born 10 August 1877 in Casthorpe, Barrowby Lincolnshire. His parents were Wiliam Sills, who was born in Barrowby in 1833, and Charlotte Leeds Smith, born in Potton, Bedfordshire in 1843. William and Charlotte Sills had nine children. Their first, William, was born in 1866, followed by Henry (1867), Edward (1868), Cicely (1870), Marian (1872), Winifred (1876), Thomas Barnard (1877), Emily (1878) and Walter (1878). Thomas’s father was a prosperous farmer. In the Census of 1881, the family lived at Casthorpe, owning a farm of 627 acres, employing four labourers and one boy. At home there was a governess in charge of seven children (William and Henry were not there), and there were six servants. By 1891, they were still at Casthorpe, now with only three servants and no longer employing a governess. William was 58 and perhaps feeling the approach of old age, but he was supported by Henry, his second son, who was a 23 year old corn merchant, and there were four other children in the house, including 13 year old Thomas Barnard. They had moved to Bottesford by 1899. In this year, Wright’s Directory recorded William Sills as a private resident living at Harley Villa in Bottesford. Interestingly, Kelly’s Directory of the same year named Henry Sills, his son, as the resident at Harley Villa. This may have been an error, or it may reflect the fact that both father and son were active members of the community. By 1901, William, now retired, and Charlotte lived at 16 Market Street, Bottesford. Henry, Winifred and Cicely were with them, and there were two servants. Kelly’s Directory of 1908 again mentions William Sills as a private resident living at Acacia House. There is some uncertainty about where exactly their addresses in 1899 and 1901 were located, but is possible that both ‘Harley Villa’ and their house on Market Street were the same building which later came to be called Acacia House. This handsome late-Victorian house can still be glimpsed today at the junction of Market Street and High Street. William and Charlotte continued to live at Acacia House. At the 1911 Census, their daughters Cicely and Marian were at home and there was also an infant grandson named Lewis Sills. They employed three servants. However, Kelly’s Directory of 1912 records that William Sills had moved to an address (unspecified) in Easthorpe. William Sills died on the 5th November 1913 at Bottesford, and his son Henry on the 10th March 1914 at Horncastle, Lincolnshire. Thomas Barnard was evidently a very hard working, studious young man. He was educated at schools in Derby and Woodford, before being admitted to St John’s College, Cambridge, in 1896, aged 19. He achieved his BA in 1899 and went on to receive an MA in 1904. He was also awarded a BSc by London University in 1900. At the same time, he became a school teacher, working as an Assistant Master at Amblecote Prep. School in 1899, teaching at Truro Grammar School from 1899 to1900, then holding a post of Assistant Master at King’s School, Warwick (Warwick Grammar School) from 1901 to 1904. He became active in the Cadet Corps at Warwick. In 1902, the London Gazette reported that Barnard Sills had been promoted to Second Lieutenant attached to the Second Volunteer Battalion, the Royal Warwickshire Regiment. He moved to Bradfield College (St Andrews College) in 1904, becoming a House Master in 1913 and remaining there until his death in 1918. The 1911 Census confirms that Thomas Barnard was a Schoolmaster at Bradfield, which was (and still is) an independent boarding school, noted for producing plays in Ancient Greek and its Greek Theatre. He completed his Teacher’s Registration in 1915. 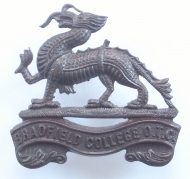 During his years at Bradfield, he took an active role in the Officers Training Corps (OTC). In 1908, the London Gazette reported that Thomas Barnard Sills had been appointed to a commission in the Territorial Force, on the Unattached List, for service with the contingent of the Junior Division, Officer’s Training Corps. He held the rank of Captain, and later of Major. 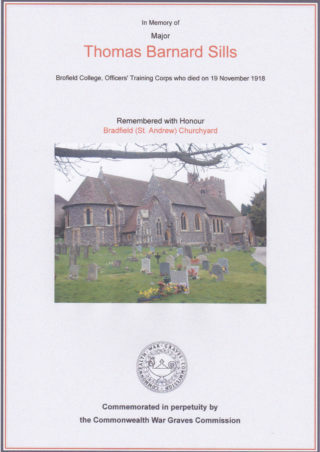 He taught at Bradfield for 15 years until he died on the 9th December, 1918, aged 41. At the time of his death he was serving in the Officer’s Training Corps, with the rank of Major. He is buried at St Andrew’s, Bradfield. His grave is cared for by the CWGC. It is doubtful that he served abroad at any time, and no Medal Index Card has been found for him. The cause of his death has not been identified, though in view of the date it must be possible that he died of the flu epidemic of that year. He left the sum of £2401 14s. 7d. in his will. Major Sills died less than a month after the armistice was signed, and at the time was on active service with the OTC. His name was not included on the Bottesford War Memorial.